Sony Pictures Home Entertainment has unveiled a release date for their upcoming release of Pride + Prejudice + Zombies, bringing the undead re-imagining of the classic story by Jane Austen to 4K Ultra HD, Blu-Ray and DVD in May. A zombie outbreak has fallen upon the land in this reimagining of Jane Austen’s classic tale of the tangled relationships between lovers from different social classes in 19th century England. Feisty heroine Elizabeth Bennet (Lily James) is a master of martial arts and weaponry and the handsome Mr. Darcy (Sam Riley) is a fierce zombie killer, yet the epitome of upper-class prejudice. As the zombie outbreak intensifies, they must swallow their pride and join forces on the blood-soaked battlefield in order to conquer the undead once and for all. The DVD version will also include the two Featurettes “Courtship, Class and Carnage: Meet The Cast” and “From Austen to Zombies: Adapting a Classic”. 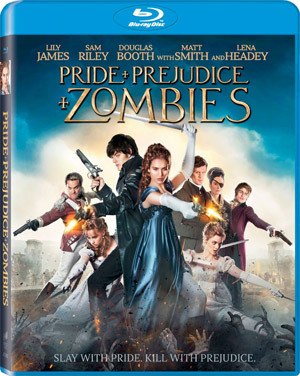 The Blu-Ray version comes with a bit more punch, dishing out Deleted Scenes, Mr. Collins Line-o-rama and a Gag Reel as extras, along with four Featurettes, titled “The Badass Bennet Sisters,” “Creating the Unmentionables,” “Courtship, Class and Carnage: Meet The Cast” and “From Austen to Zombies: Adapting a Classic”. 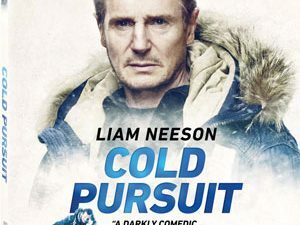 The 4K Ultra HD version of the release will offer up the feature film in 4K resolution with High Dynamic Range (HDR) and a Dolby Atmos soundtrack (Dolby TrueHD 7.1 compatible), along with all the bonus materials found on the Blu-Ray version. “Pride + Prejudice + Zombies” will be in stores on May 31 for $34.99 on Blu-Ray Disc and $26.99 on DVD. No price point has been announced for the 4K Ultra HD version, but we expect it to be priced at $45.99.